Happy Friday everyone!! 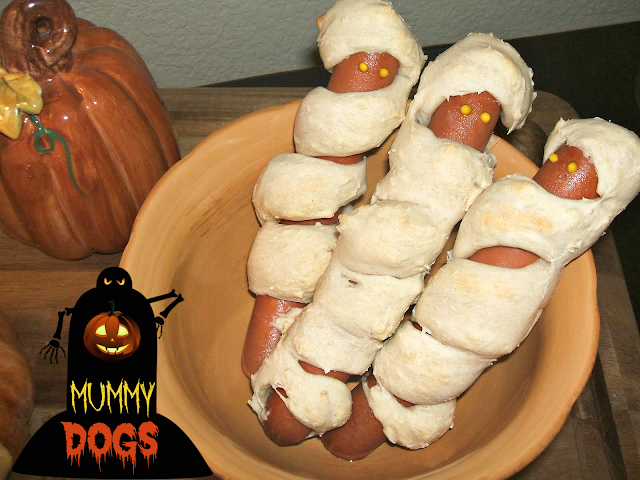 I've got at least one last Halloween treat for you all..Mummy Dogs! You really can't go wrong with these, they are so kid friendly. I guarantee you put these in front of your kids on Halloween and they will be thrilled! Roll a strip of dough about a foot and a half long, and start twirling it around the hot dog, and at the end, wrap the dough completely around the end of the hot dog, leaving a space between that and the last twirl of dough so you have a place to put your "eyes". Bake in a pre-heated 450 degree (that's what my dough calls for) oven for 12-15 minutes. In the space between the dough on the hot dog, dot 2 eyes with mustard. Kaitlin these are just adorable! The little "eyes" bring it all to life...how cute. I want you to know that I've really enjoyed your enthusiasm for Halloween...everything from you great halloween decorations to your web page decorations and recipes. Its been so cute. I think these are so cute and clever! so cute, great for kids! happy halloween!